This gives the soundman context and a good starting point for setting up lines to the stage. This should be a bulleted list with names of the band members and their instruments. Below each bullet, include a sub-bullet that states how many and what type of inputs each requires, otherwise known as an input list. For example, under your keyboard player you might write "2 XLR -> DI -> board" as well as any particulars such as, "our vocalist sings through a mono effects pedal -> DI -> board." This should give the soundman a clear picture of how many people are in the band, which instrument each person plays, and how many lines/inputs will be on the stage feeding the console. Be specific – include the main pieces of gear, but also less obvious things such as: mic stands, a drum throne, hardware, cymbals, a rug, amps, DIs, microphone types, etc. This should be in the form of two lists so that the soundman has an easy-to-scan checklist. The band will supply: drums, cymbals, two guitars, bass, one guitar amp, keyboards with interface, two DIs, one dynamic vocal microphone. The venue will supply: drum hardware (specify which kind), drum throne, carpet, one tube bass amp (Fender Bassman TV duo 350 watt or similar), one guitar amp (Fender Hot Tod or similar), three DIs, eight mic stands. I would also recommend adding: "If the venue is unable to provide any of the equipment above, please contact [band representative with email] so we can coordinate other arrangements." Better to know in advance than to be surprised at soundcheck three hours before a show. 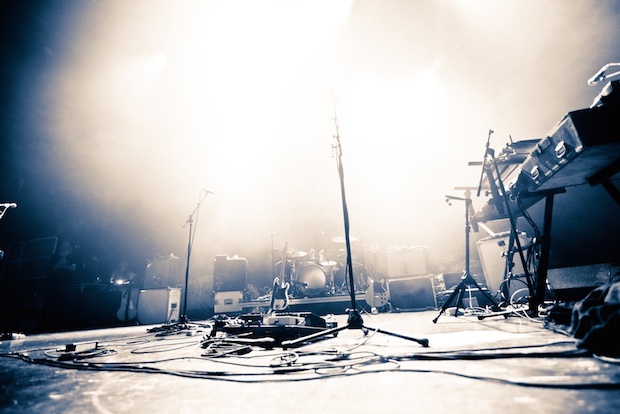 Some venues have specs of their backline and frontline on their website, so you can always check that out first to save some back-and-forth. "Frontline" refers to the PA system. 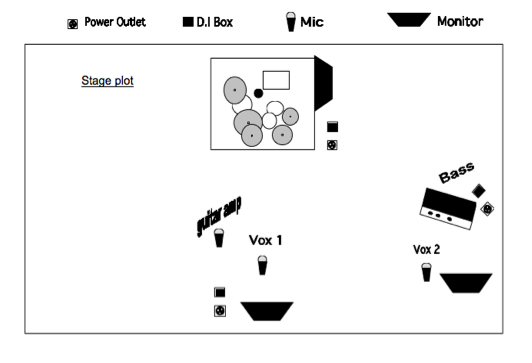 Make sure your tech rider clearly states your expectation from the PA, monitors, and console. This should include general specs such as two-way speakers, wattage, how many monitors you’ll need on stage, and whether you require a subwoofer. A sub might be very important for your sound, and not every PA has one. This is more likely to be the case for venues that don’t usually have band performances and are renting a PA especially for your performance. If you need certain effects on the console, write them either on your input list next to which channel the effects belong on, or in your frontline description as a general requirement. EQ is standard on pretty much every console, but compression, gate, reverb, and delay might not be, especially with smaller venues or PA rental situations. Reiterate the total microphone count (and which kind) from the input list since this is an important "bottom line." Need any extra cables from the venue? Include that as well, but don’t count on it. And to avoid any misunderstanding, specify whether you have your own soundman or you're expecting the venue to provide one. You can’t expect that your soundman will listen to your music before your concert, especially if he's running sound on a nightly basis for a club or a festival. But you will benefit greatly if he does, as he will get acquainted with your sound. One thing you can be sure of is that if you don’t make it really easy for the sound engineer to check out your music, he probably won’t. I recommend including a link to your songs in a free, streamable format in your tech rider. It can also be useful to refer to the name of a well-known artist who has a similar sound to yours. If he doesn't get a chance to listen to your music and soundcheck ends up being just a quick line check, at least he'll know whether you’re aiming for U2-style vocal delay washes or a dry overdriven Strokes sound. You don’t want them figuring this out halfway through your set. You’d be surprised how many bands forget to include this in their tech rider. A busy soundman is likely to check out your tech rider a day or two before the show, and then print a hard copy to take the club the day of the show. If he or she needs clarification while setting up, make yourself easy to reach by telephone and email. Start your relationship with the sound engineer positively. Thank him in advance for his help. He can either be your best friend or your worst enemy when you're onstage. A good tech rider is one of many things you’ll need to prepare before heading out of the rehearsal room for a concert or tour. Hopefully this checklist will help you draw one up, get clarity about your stage requirements, and save you any misunderstandings and time when you show up for soundcheck. Shachar Gilad is the Founder and CEO of SoundBetter, the leading directory of music production talent. He is a touring musician, audio engineer, and producer. Before SoundBetter, he designed and marketed tools for musicians and engineers at Waves Audio and Apple Inc.